Create a colourful, personalised flower by decorating your own handprint. These flowers made a lovely keepsake for children and family members. Paint a long bamboo stick with white Pebeo matt décor acrylic paint. Leave to dry. When dry, apply a coat of leaf green acrylic paint onto the bamboo stick. Leave to dry. Add another coat. Leave to dry. While you are waiting for the bamboo stick to dry, download the template for the leaves and the flower centre circle and print off. Use the template to cut out the leaves from a sheet of green card. 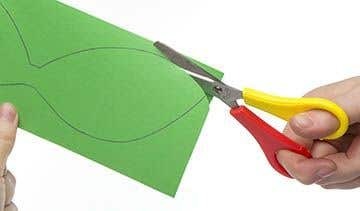 Cut out the circle shape from a sheet of yellow paper. Select a piece of A4 white or coloured card and draw around your hand on the card with a pencil, then cut out the hand shape. 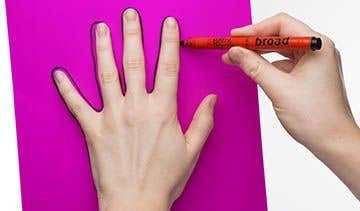 Take the yellow circle and stick onto the middle of your handprint using a glue stick. Personalise the yellow circle with your name or smiley face. 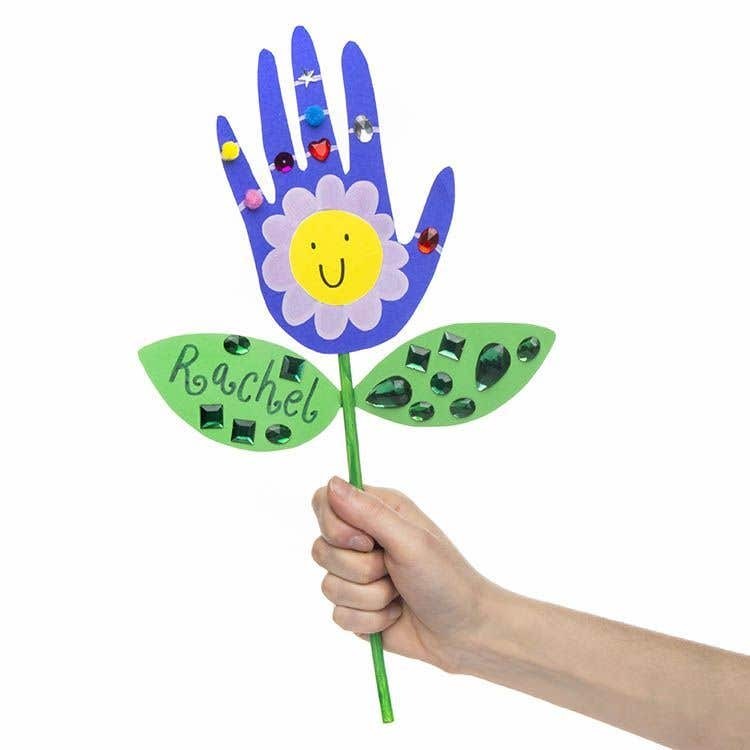 Decorate your handprint flower using coloured pens, stickers, gems, glitter etc. When you have finished decorating your flower hand print, take a small strip of double sided tape and stick it to the back of the flower. Peel off the backing and attach the bamboo stick. Decorate the leaves then attach to the bamboo stick using glue dots. Why not create a decorative bouquet of handprint flowers of all the family members. Also, its an opportunity to use up any odd stickers, jewels, glitter etc. for decoration.